The 30th match of IPL 2019 will feature Delhi Capitals visiting Sunrisers Hyderabad at the Rajiv Gandhi International Stadium on April 14. 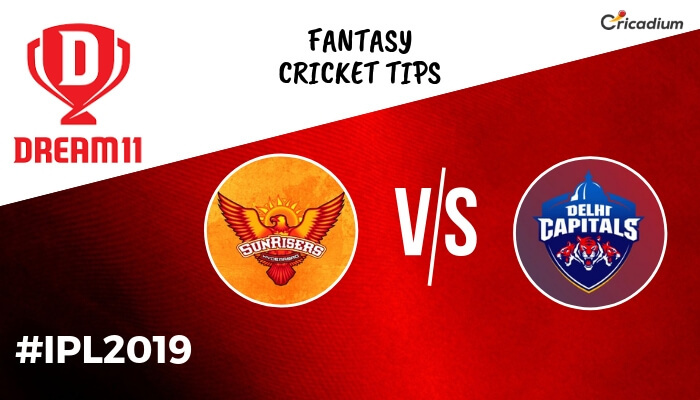 Keep reading to find out Dream 11 team prediction and Dream 11 fantasy cricket tips for the today IPL match 2019 SRH vs DC. SRH, after winning 3 consecutive games, has lost 2 in a row. On the contrary, DC comes into the game with 2 back to back victories. However, SRH is a strong unit at home and the visitors might have a tough time. Check out the Today IPL match 2019 SRH vs DC Dream 11 Prediction and Team. Both Rishabh Pant and Jonny Bairstow are strong candidates for the wicketkeeper’s pick. But on current form, Bairstow is a better selection. He has scored 263 runs so far in the tournament at an average of 43.83 and a strike rate of 161.35. David Warner is an obvious choice in the team. Also, we think he would be a great option for captaincy’s slot. Prithvi Shaw showed good form earlier but failed on a couple of occasions. This might be his game to find form again. Rashid Khan is another that will make it to most sides. Kagiso Rabada has been the leader of the attack for DC and has been picking up bucket loads of wickets.